"When unsurpassed quality is combined with mastery of technique, hospitality at its best and passion for authentic espresso preparation and presentation, the result is perfection in the cup-a multi-sensory experience that can only be described as art. "Illy recognizes the elite cafés where this high standard is achieved with the designation Artisti del Gusto (Artists of Taste), and invites you to enjoy the ultimate Italian espresso experience at an Artisti del Gusto café" Bottega Italiana has been designated as "Artisti del Gusto" café. Based in Trieste, Italy, illy has been "seeking perfection" since its inception in 1933. This search has lead them to become a world renowned and authoritative figure in the coffee industry. 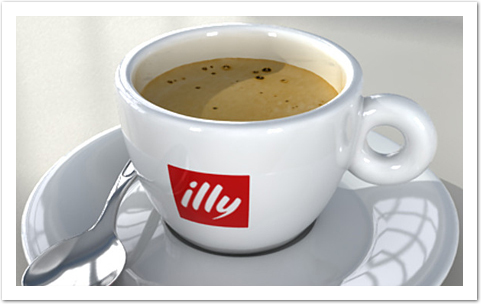 Consisting of pure Arabica beans illy espresso is silky, smooth and consistent. We love working with illy for its great vision and high values, but what we really find irresistible is illy's flavor, fine color and the way it can make hours pass like moments. Stop in and you'll see what we mean.